When Brian of The Wannabe Homesteader promises the "easiest way to grow tomato seedlings," he isn't kidding. "It's very simple. 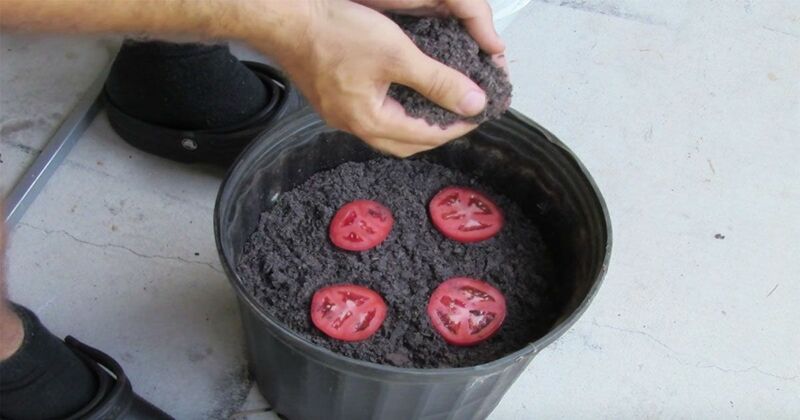 All you need is dirt, a pot and some tomatoes!" In the video below, he simply slices a tomato and tosses the slices into potted dirt, proving his "quick and dirty tip" is exactly that. He then displays some seedlings he's already started growing via this method. "Grocery store gardening" is not a new practice, but the fact that Brian's video has more than 2 million views and many of the hundreds of comments express surprise and thanks for the simple method is an indication of how far removed we are from our food. Growing things from our grocery store's produce aisle can help bridge this gap without the commitment to a full-size vegetable garden. If you're interested in growing tomatoes this way, the best plan is to use tomatoes from a friend's garden or an organically grown grocery store variety that is labeled "heirloom." A tomato without this label is probably a cross-pollinated hybrid, which can produce fruit different than what you're expecting. But there's nothing wrong in giving it a shot — experimenting is fun! Nonorganic vegetables are sometimes irradiated, or sprayed with chemicals intended to inhibit sprouting, so it's best to avoid them altogether. Please share this article before heading to your refrigerator to give this a try ... and tell us your results in the comments below!